The AcceleDent System is a new technology designed to decrease the time you are in braces or invisalign by increasing the rate of tooth movement. The AcceleDent System is light, comfortable, hands-free and can be used 20 minutes per day while engaged in variety of daily activities including reading, watching television, listening to music and doing school work. 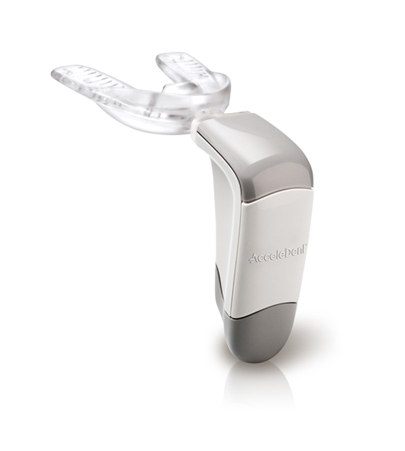 The appliance, used daily for 20 minutes, applies patented technology to gently vibrate the teeth and surrounding bone. The microvibrations increase the rate of bone remodeling and allows the teeth to move 38-50% faster. AcceleDent has a good safety profile, as indicated by university studies in humans. AcceleDent is considered safe and under normal conditions of use with a conventional fixed orthodontic appliance.